Although you may not realize it, your mouth hosts a jungle of organisms and bacteria (over 600 different species of bacteria, to be precise). That could be a scary number, but thankfully, most of these bacteria are harmless and just want to enjoy your unwitting hospitality. Some are even helpful and assist in neutralizing harmful bacteria and other agents. There are a few, though, that deserve careful attention. The following two, in particular, are among the most notorious oral bacteria that work tirelessly to compromise your oral health, and as a result, your long-term systemic wellbeing. At any given moment, there are about 10-15 billion individual bacteria in your mouth. Tracing the pathology of these bacteria can be difficult, but luckily researchers have worked diligently to do just that. When your mouth’s microorganisms accumulate, it mixes with saliva and food debris to form the biofilm known as plaque. 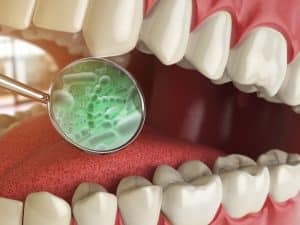 One specific bacterial species, Treponema denticola, does the most harm by forming a gang of sorts with other bacteria and then attacking the tissues in your mouth. Researchers from the University of Bristol discovered that T. denticola carries a molecule known as CTLP that allows it to latch on to other bacteria. Once gathered, the group of bacteria led by T. denticola and its CTLP molecule inhibits blood clotting, leading to excessive gum bleeding and increased risks for cardiovascular health issues. Perhaps one of the most notorious oral bacteria is Porphyromonas gingivalis. It may not be famous, but P. gingivalis has the potential to cause much more serious harm than most of its cohorts. This bacterium develops molecules to evade the body’s inflammatory response, leading to excessive inflammation as your immune system tries to find and eliminate it. This inflammation is a major contributing cause to the formation of gum disease. When the bacteria infiltrate the body through the bloodstream (i.e., through cuts in the mouth or diseased gum tissues), they can excite the same reaction in the rest of the body. P. gingivalis is suspected of being one of the defining links between oral disease and heart disease. With extensive experience diagnosing and treating the most severe oral and periodontal health issues, Dr. Kania can help you protect your systemic wellbeing with expert periodontal care. To learn more, schedule a consultation with Dr. Kania by calling her periodontal office in Encinitas/San Diego, CA, at (760) 642-0711.